C. Wright, Paintings in Dutch Museums. An Index of Oil Paintings in Public Collections in The Netherlands by Artists born before 1870, London, 1980, p. 217. Old Master Paintings: An illustrated summary catalogue, Rijksdienst Beeldende Kunst (The Netherlandish Office for the Fine Arts), The Hague, 1992, p. 165, no. 1374, illustrated. Kleve, B.C. Koekkoek-Haus, on loan. J.H. Koekkoek was born in Veere and went to nearby Middelburg to be trained at the local wallpaper factory. 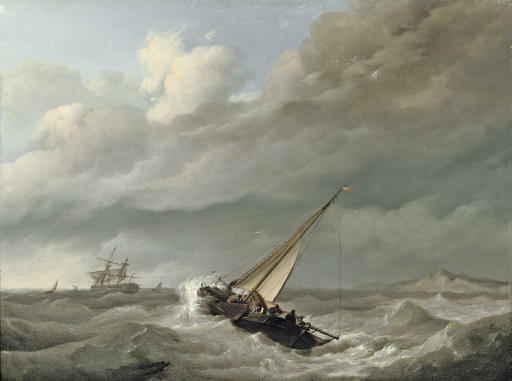 He developed into a painter of marine scenes, teaching in Middelburg. In 1826, he settled in Durgerdam, and moved to Amsterdam in 1833. He was head of an extraordinary dynasty of artists that included his sons Barend Cornelis (1803-1862), Marinus Adrianus (1807-1868), Johannes (1811-1831) and Hermanus (1815-1882), all of whom were born in Middelburg, down to his great grand sons, Hermans Willem (1867-1929) and Marinus Adrianus II (1873-1944).